I thought "game changers" referred to the people who post videos of gameplay and guides so maybe this is the vlogging hobby? It looks like it was just a push update. There's a new "Internet Icon" hobby. With a "Authentically Iconic" story and related hobby collections. Looks like we need to unlock the Internet Icon heirloom to unlock the hobby. I got an actual update today, and the Internet quest started. 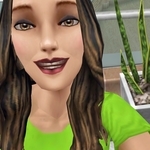 I'm on task 5 of 14, which is to earn 650 simoleons. I'm simultaneously doing the wedding quest, on which I'm doing the second to last part (the actual wedding). Should be done with that by tonight, so I can get down to earning mor simoleons. Oh, yeah, the time for the Internet quest string seems to be 4 days.